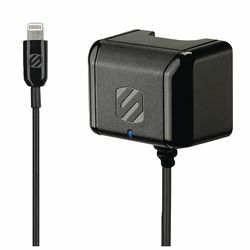 Use Scosche's quick charging reVAMP 2.4 amp car charger to recharge your newer Apple iPad with the Lightning connector. 12 Watts of power will charge your device as quickly and efficiently as possible. Compatible with iPhone® 5, iPad mini, iPod nano® 7G, iPod touch® 5G and iPad with Retina Display (fourth generation). Charge the power hungry iPad (4th gen) and iPad mini at their full potential. 3-foot coiled cord is built in and gives you the freedom to use your device while it charges. Devices shown not included. "Made for iPod," "Made for iPhone," and "Made for iPad" mean that an electronic accessory has been designed to connect specifically to iPod, iPhone, or iPad, respectively, and has been certified by the developer to meet Apple performance standards. Apple is not responsible for the operation of this device or its compliance with safety and regulatory standards. Please note that the use of this accessory with iPod, iPhone, or iPad may affect wireless performance. 5V DC, 2.4 amps, 12 watts max.